After a semi-fairly comfortable win over Bowling Green last Wednesday, Michigan traveled to Madison Square Garden to take on Cornell, the team that knocked them out of the postseason last year. They did not come away with the same result as their basketball-playing classmates, getting rolled 5-1 by a Cornell team that hadn't won in almost a month. What do you even say at this point? Is the problem the goaltending? Team defense? An offense that's suddenly ice-cold and has fallen to 10th nationally? Unfortunately it's probably all of the above, which means there's a lot of work to do if the Wolverines are going to keep their NCAA-record tournament streak alive. This week Michigan goes on the road for a two-game series against Ferris State. Last year's national runners-up is 6-4-2 on the season and sitting at 5-3-0-0 in the CCHA, which is good for a three-way tie for second place, one point behind Miami (or, more accurately, two games in the loss column behind Notre Dame). The Bulldogs are coming off their first sweep of the season, against Bowling Green, and have won three in a row. They've actually played an exceptionally weak schedule to this point (RPI, Mercyhurst, Alaska, Miami (the one tough opponent), LSSU, BGSU), so they may not be as strong as the CCHA standings indicate. RPI beat them and tied them, and just recently won another game. The outstanding Taylor Nelson is no longer on the team, but they are still just fine in net. CJ Motte, brother of 2012-13 Michigan signee Tyler Motte, has played all but 20 minutes for the Bulldogs. He has a 2.20/.928 on the year. He hasn't given up more than 3 goals in a game, but he has done that on seven different occasions. He has shut out Miami twice in two years, so he can step it up when it matters. He posted very similar numbers a year ago, despite most of his action coming on the road. Chad Billins (a 29 point-scorer from back on the blueline) is also gone, as is leading scorer Jordie Johnston. The Bulldogs' top returning scorer, Matthew Kirzinger, hasn't played all year. 19-goal scorer Kyle Bonis is back, and in fine form. He leads the team with a 6-5--11 line in 12 games, with 4 PPGs. Cory Kane had 11 points as a sophomore, but already has 9 this year. Simon Denis had 13 points in 30 games on defense last year. He's already got 8 points. The Bulldogs rank 17th in scoring at 3 goals per game and 20th in defense at 2.5 goals per game. They're fifth on the power play, largely thanks to Bonis, at 25.6%. The PK is pretty good as well at 85%. Michigan needs to start getting sweeps, but this feels like a split. And it feels like I'd be happy with that. After looking like they may have turned a corner with a 5-1 win over Michigan State last Friday night, the Wolverines have lost three straight and now find themselves two games below .500 and with an ugly 2-5-1-1 record in CCHA play, bad for 9th in the conference. This past weekend, the Notre Dame Fighting Irish came into Yost and skated out with 3-1 and 4-1 victories, both of which were closer than the final score indicated, though that's small consolation. With something along the lines of 80 former players in town for the Yost rededication ceremony, that wasn't the weekend Michigan was hoping for. On Thursday night in a nationally televised game, the Wolverines came out and played an excellent first period, They took a 1-0 lead on the first goal of Justin Selman's career after Robbie Russo's clearing attempt went right to him. Selman walked in alone and put one past Steve Summerhays and up under the bar. Shots were even at 9, but the Wolverines largely carried the play. After that, though? It was all Notre Dame. Just as in the first period, the shots were even (13-13) but one team more or less dominated, that being the Irish. They tied the game up on a Mike Voran short-handed goal early in the second, and Michigan seemed fortunate to get out of the second period with the game tied. On the goal, the Irish took control deep in their end and hit on a long pass to Tynan at the far blueline. It looked like Michigan had gone for a change, so it was Voran and Tynan against one Wolverine. The pass got across and Voran blasted a one-timer past Racine. In the third Michigan never seemed to get anything going in the offensive end. The Irish outshot Michigan by a 10-3 count and added two goals late in the contest to earn a 3-1 victory. Bryan Rust scored on a wraparound with just over five minutes left in regulation and then Peter Schneider was given credit for an insurance goal with about 1:30 remaining when a shot that was well wide deflected in off Mike Chiasson's shin pads. It's been that kind of season so far for Michigan. Steve Racine made 29 saves in the loss and was decidedly not the problem. He was spectacular at times, keeping Michigan in a game that they had no business being in after the first period. He made a couple of fantastic post-to-post stops. At one point, I made the joke on Twitter that he had committed so many robberies that Mark Dantonio told him he could be on the practice field on Monday. The Wolverines actually missed a few chances to get out of the first period with a much larger lead. Jacob Trouba ripped one off the post, Justin Selman just missed a post by a couple of inches on a puck that slid through the goalmouth, Boo deked his way to an empty net and had the puck roll off his stick, Copp rung one off the bar, and that was all in the first period. After that? I don't know what happened. The SHG had to be deflating, but they never mounted anything resembling an offensive attack the rest of the game. The next night was pretty similar. We're 1-1 after two periods, shots are 15-12 Michigan, and things just came apart late in the third period. This time, the Irish scored 2 1/2 minutes apart to build a 3-1 lead and then added an empty-netter for the final margin of victory. 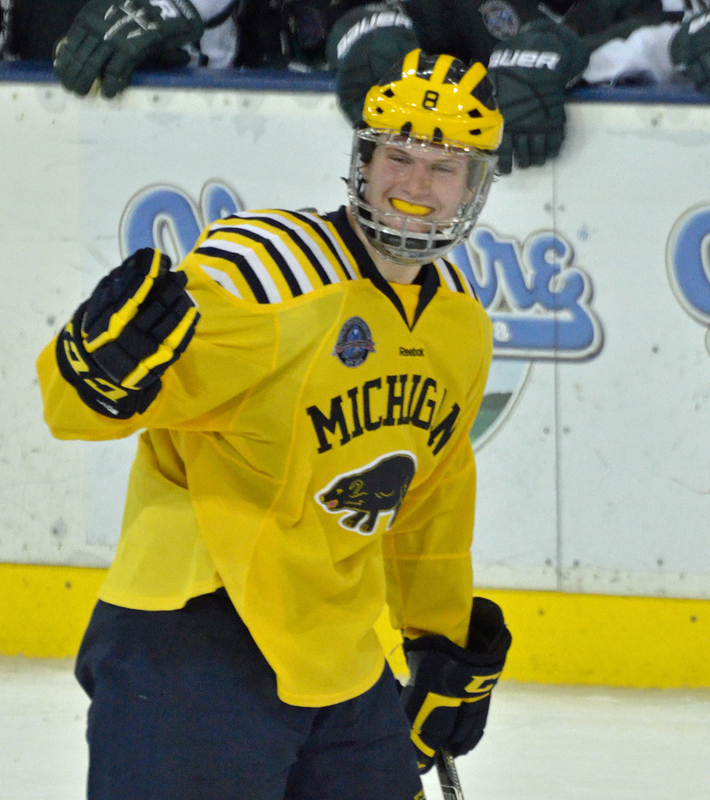 Jacob Trouba scored unassisted for the Wolverines off another ND turnover. The puck rolled to the faceoff circle and Trouba absolutely uncorked one into the net. Michigan nearly took a lead when PDG came in on a partial breakaway, but after a nice move he hit it off both goalposts. Again, that kind of season. The Irish regained the lead off a bad turnover by DeBlois that got dumped into the Michigan end, where Moffie had a brutal turnover behind the net. Rust centered it for Costello and he easily slid it by Racine. Mario Lucia added another goal when Chiasson tried to shovel the puck out of the slot and put it right onto Lucia's stick. He roofed one. No chance for Racine, and another home loss for Michigan, making 4 on the year. On the plus side, Racine was really good in net Thursday night and you couldn't fault him for the goals that got past him Friday either. They also had tie games deep in the third period against a really solid Notre Dame team when they weren't really playing that well. I suppose that's a positive, even though both games got away really quickly. In the minus column? Sloppy turnovers and absolutely nothing in the way of offense outside of the first period Thursday. (I didn't see Friday's game, but there weren't a whole lot in the way of highlights of scoring chances, outside of one Selman look.) Both goals were off bad ND turnovers, so they didn't create a whole lot on their own. It's still only a quarter of the way through the season and there's plenty of time to right the ship (North Dakota does this every year, seemingly). But with a road-heavy schedule in the second half, they really need to start playing better sooner rather than later. Michigan returns to the ice on Wednesday for a single game at Yost against Bowling Green. The Falcons have struggled this year, but they do have Andrew Hammond in net, so they're always an upset threat. They haven't scored more than 3 all season, so hopefully this will be a good way for Michigan's beleaguered defense to get back to playing sound hockey in their own end. There is no more College Hockey Showcase, but the Wolverines will head to Madison Square Garden to play Cornell on the Saturday after Thanksgiving. Hopefully the Maize and Blue faithful will get to see three wins at MSG this holiday week, with the basketball team playing there twice as well. Last thing: The signing period is underway and the Wolverines have recieved LOIs from Evan Allen, Bryson Cianfrone, and Michael Downing at the very least. Those are the three that have posted on Twitter that they've signed. Allen, though, is said to be considering going the OHL route. Unfortunately one of the usual suspects, Windsor, holds Allen's rights, so I'm sure that's a battle that will be going until the very end. Zach Hyman will be playing in the Maccabiah Games, the "Jewish Olympics", over the summer. Michigan took just two points against the Northerns last weekend, and they were probably lucky to get that much. On Friday night they trailed 4-1 after two periods before mounting a miracle comeback that culminated in AJ Treais's goal with 0.6 seconds left in regulation. Michigan then won in a shootout on another Treais goal. Saturday it was more of the same. The Wolverines trailed 4-1 after two for the second straight night and for the second straight night they mounted a comeback. They fell just short, however, by a 4-3 score. With the way the game is called these days and with the emphasis on preventing concussions, that's going to be a DQ. Truth be told, though, the guy has his head down, he's leaning forward, and Trouba is a big dude to start with. He's going to hit him in the head whether he wants to or not. I get that they are putting the onus on the hitter to do it safely and with the way the rule reads that's the right call, but man....get your head up, son. That's the way I skate, and I could never play in a checking league because I would die within five minutes. I don't have a problem with the DQ and subsequent game suspension, especially because the hit was with just over five minutes left in regulation, but if he had gotten any more than that I wouldn't have been happy. It's going to end up being just like in the early 2000s when they ejected players for any hit from behind, no matter how insignificant it was. I remember Porter getting tossed for one that was just comical. In other news, AJ Treais has seven goals in seven games, which puts him third nationally in that category behind guys from Dartmouth and Yale. So that puts him first nationally in that category. Only Giancarlo Iuorio from Niagara has more goals. Mac Bennett is second national in points per game amongst defensemen with 9. Trouba is first amongst rookie defensemen and 6th nationally amongst freshmen in points per game. And destroyed Northerns. That couldn't possibly have been more wrong. Currently the Wolverines rank first in the nation, scoring a whopping 4.43 goals per game. The downside? They're 50th nationally allowing 3.43 goals per game. Jared Rutledge will be back between the pipes Friday night and we're going to see what he's made of. It's hard to imagine more pressure being on a young goalie in a regular season game in the second month of the season. He needs a good performance and it's a rivalry game against FYS. I really hope the crowd is supportive and doesn't get on him or get audibly anxious if he gives up a bad goal in the early going. The Spartans rank 38th in offense (2.50 goals per game) and 39th in defense at 3.00 goals per game. As I'm sure you can imagine with numbers like those, it hasn't been a good start to the year for the young Spartan team, which features just four NHL draft picks. Minnesota did to them in their opening weekend what Alabama did to our football team. The only difference is our players weren't on Twitter saying that Jerry Sandusky would be proud of what Minnesota was doing and saying that Mike Szuma could play goal for them. Since then, they earned a win and a tie against Niagara before splitting with LSSU and BGSU. They're led offensively by sophomore Matt Berry and freshman Matt DeBlouw, a draft pick of Calgary, with 3-4--7 lines in the eight games they've played. They combined for 8 of those 14 points in their 6-1 win over BGSU last Saturday. All of Berry's goals have come with the man advantage. In fact, 9 of FYS's 20 goals have come with an extra attacker. Their PP is 25.7%, good for 9th nationally. The PK is 23rd at 85.7%. The Spartans also have a freshman named David Bondra. Like, Bondra Bondra, son of 2x 50-goal scorer and former Detroit Viper Peter Bondra. He has 1 assist in 8 games. On the blueline, freshman John Draeger has chipped in with four points. Matt Grassi is their senior leader. In net, DREW PALMISANO IS FROM ANN ARBOR has graduated. Will Yanakeff WHO ALSO PLAYED IN ANN ARBOR AT USA is still there and is 2-3-1 with an ugly 3.49/.884, which was no doubt hurt by that awful weekend against the Gophers. Freshman Jake Hildebrand is 1-1-0 with a 1.72/.938. He picked up a win against the Lakers and was in net for a 1-0 loss to Bowling Green last weekend. Friday night's game is at Yost. Saturday's game will be at the Munn Memorial Library. Both games will air on Comcast, grumble grumble.